Almighty God, by Your grace the apostle Andrew obeyed the call of Your Son to be a disciple. Grant us also to follow the same Lord Jesus Christ in heart and life, who lives and reigns with You and the Holy Spirit, one God, now and forever. Amen. 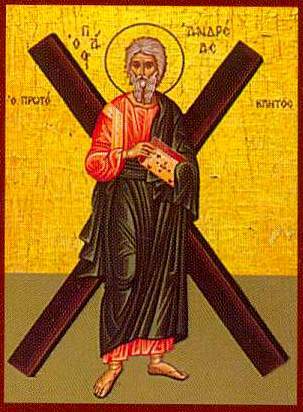 About St. Andrew, the brother of Simon Peter, was born in the Galilean village of Bethsaida. Originally a disciple of St. John the Baptist, Andrew then became the first of Jesus’ disciples (John 1:35-40). His name regularly appears in the Gospels near the top of the lists of the Twelve. It was he who first introduced his brother Simon to Jesus (John 1:41-42). He was, in a real sense, the first home missionary, as well as the first foreign missionary (John 12:20-22). Tradition says Andrew was martyred by crucifixion on a cross in the form of an X. In AD 357, his body is said to have been taken to the Church of the Holy Apostles in Constantinople and later removed to the cathedral of Amalfi in Italy. Centuries later, Andrew became the patron saint of Scotland. St. Andrew’s Day determines the beginning of the Western Church Year, since the First Sunday in Advent is always the Sunday nearest to St. Andrew’s Day. A Second Reflection: Andrew is the patron saint of Scotland and his X-shaped cross is on the Union Jack of the United Kingdom. When I look at the icon above and the flags, I think of searching for buried treasure with the map which has an “X”, as in, “X marks the spot”. Our map is both the Bible and the Lutheran Confessions to show us where “X marks the spot”: first, a manger then later the Cross. This where and when our salvation occurred. The Bible is the true compass to show us the Way (see John 5:39). This is where true treasure is buried and worth digging up and selling all to have and hold as we have been held: Matthew 13:44-46. Other religions purport to have maps leading us to the divine. The Biblical faith alone shows us where the Lord came down to us and for us and our salvation because without Him we are dead and lost (see Luke 15 and Ephesians 2:1): again, X marks the spot. Scripture is the Map. We read in Romans: “For whatever was written in former days was written for our instruction, that through endurance and through the encouragement of the Scriptures we might have hope.” (Romans 15: 4) The Apostle Paul wrote to his brother and fellow pastor: “…continue in what you have learned and have firmly believed, knowing from whom you learned it 15and how from childhood you have been acquainted with the sacred writings, which are able to make you wise for salvation through faith in Christ Jesus. 16 All Scripture is breathed out by God and profitable for teaching, for reproof, for correction, and for training in righteousness, 17that the man of God may be competent, equipped for every good work.” (2 Timothy 3: 14-17) We recognize saints like Andrew because they were good guides for the Lord’s Church, faithful to the Word Incarnate, written and spoken, “equipped for every good work”, to show us the Way to the new heavens and the new earth through the valley of the shadow.